On 25 March 1997 The Boeing Company received an $8 million contract from the US Navy for the Low Cost Missile System (LCMS) Advanced Technology Demonstration (ATD) program, called Fasthawk. The 36-month program demonstrated technologies applicable to a next-generation, ship-launched, land attack missile system. The LCMS ATD program was conducted jointly with the Naval Air Warfare Center, China Lake, CA. The LCMS concept comprised a fin-less, bending body airframe, fixed geometry annular inlet, and a slip-out booster/ramjet engine. It was to demonstrate through a series of ground and flight tests the technologies required to deliver a 700-pound payload to a range exceeding 700 nautical miles at a speed of Mach 4.0. The Office of Naval Research sponsored the Hypersonics Weapons Technology (HWT) and the Low-Cost Missile (LCM) programs. The HWT Program investigated technologies necessary for effective weapon-system operation in the hypersonic realm. The LCM Program - commonly known as Fast Hawk - was to develope an entry-level capability for a Mach 4 hypersonic weapon. Both of these ONR programs fed into the Hypersonic Strike (HyStrike) Program sponsored by the chief of naval operations (N88; N87; and N86). 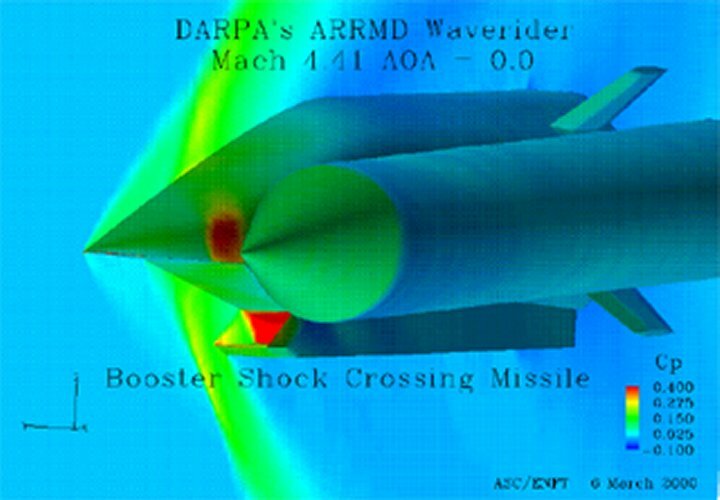 The Low-Cost Missile System (LCMS) Advanced Technology Demonstration (ATD) demonstrated technology for a free-flight test of a bending annular missile body (BAMB) ramjet missile configuration with a 700-lb warhead, 700-nmi range at Mach 4.0/70,000-ft altitude using thrust vector control ahead of the ramjet engine for transition to the FASTHAWK supersonic cruise missile. The LCMS was selected by the Navy's Science and Technology Working Group as the top-rated Navy Advanced Technology Demonstration Program for fiscal year 97. Autonetics and Missile Systems Division partnered with the Naval Air Warfare Center, Airframe, Ordnance, and Propulsion Systems Division for the program. Joint risk-reduction activities were conducted earlier this year in the areas of propulsion, thrust vector control, and guidance and control. The Low Cost Missile System was terminated for high payoff technical alternatives, cost growth and lack of transition support. FY 1999 efforts were limited to documentation of progress to date. In June 1998 DARPA selected Boeing to pursue development of the hypersonic [Mach 6+] Advanced Rapid Response Missile Demonstrator (ARRMD). ARRMD was intended to be a low cost hypersonic missile approach to engage time critical targets at ranges in excess of 400 nautical miles. Operational capability was projected for 2010. Boeing studied two different ARRMD designs, a wide, flat "waverider" shape and a more conventional cylindrical configuration. No flight hardware was fabricated, and the studies were completed in 2001. These two configurations later surfaced under new programs, the DARPA/ONR cylindrical HyFly - Hypersonics Flight Demo and the AFRL X-51 waverider.